Volunteers in Yemen are on the front line in the fight against malnutrition and hunger. Needs are immense. The case of Farah, a 10-months-old infant affected by malnutrition, is not isolated. The country is on the brink of a famine, if the war doesn't stop. 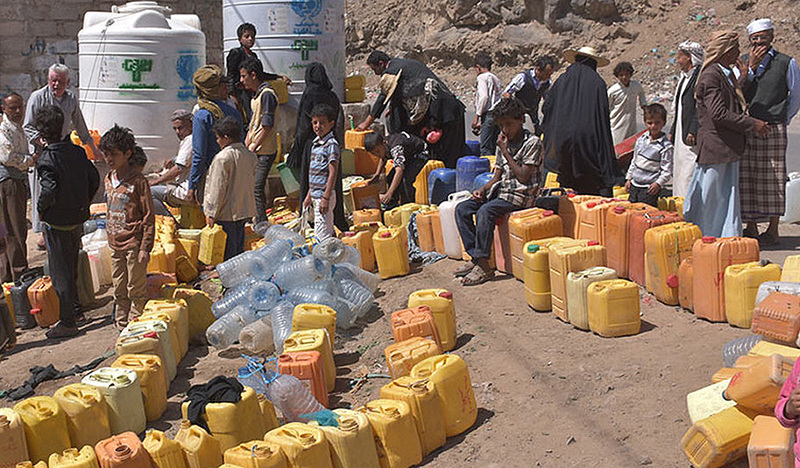 Families line up for water distribution in Yemen. The Relief and Development Peer Foundation (RDP) is a Yemeni non-governmental organization working to implement Food Security and Livelihoods projects, among others. RDP team meet every day cases like the one of Farah, who is suffering from malnutrition as thousands of other children in Yemen. RDP staff benefits from the support of dozens of volunteers. “In Taiz Governorate, volunteers have contributed to food security needs assessments, they have prepared the food assistance vouchers and have participated in their distribution,” explains Ejlal Yahya, RDP’s Food Security and Livelihood Program Coordinator. Volunteerism also gives the opportunity to many Yemeni youths to take an active role in facing the crisis, she adds. UNV has nine Volunteers currently serving in Yemen, three Internationals and six Yemeni nationals. Most of them are serving with UNDP on development projects. There could be more. Needs are immense. UN Volunteers are one of the talent-management solutions available to the UN system and development community. "I think many of us felt as we went into the 21st century that it was unthinkable that we could see a famine like we saw in Ethiopia, that we saw in Bengal, that we saw in parts of the Soviet Union – that was just unacceptable. Many of us had the confidence that would never happen again and yet the reality is that in Yemen that is precisely what we are looking at," she explained in a media interview. The nutrition situation continues to deteriorate, according to the World Food Programme. A recent survey showed that almost one third of families have gaps in their diets, and hardly ever consume foods like pulses, vegetables, fruit, dairy products or meat. Some three million pregnant and nursing women and children under five need support to prevent or cure malnutrition. In 2017, WFP provided food assistance for up to 7.3 million people every month. WFP has more than doubled the number of people reached in Yemen. However, due to financial constraints, only about half of these people are receiving full rations.